Grant County’s Glenn Palmer faces state DOJ criminal investigation for his actions during standoff – and for some beforehand, too. A lot of people in Oregon’s Grant County weren’t particularly surprised last week when the Oregon Department of Justice announced it was opening an investigation into the county’s chief law enforcement officer, self-proclaimed “constitutional” Sheriff Glenn Palmer. A lot of them had seen trouble coming. It extended even beyond Palmer’s involvement in the takeover of the Malheur National Wildlife Refuge, located in neighboring Harney County, in January by an armed contingent of fellow “constitutionalists” – including concerns that he had become viewed as a “security leak” in the days leading up to the arrests of 11 of the extremists on Jan. 26. Apparently, there had been warning signs even before the Malheur occupation. For example: Why exactly had Sheriff Palmer, in the summer and fall of 2015, hired over 70 “special deputies” to serve as adjuncts to his regular force? Those and other questions – including the police powers of those “special deputies,” who’s paying for them, and what criteria Palmer is using in selecting them – apparently will be included in the Oregon DOJ’s investigation, at the behest of the state’s police-standards agency, which had been alerted to concerns about the deputies by other local law-enforcement officers. Even before the investigation was announced, Palmer had told a number of reporters, including the Oregonian’s Les Zaitz, that he would not be responding to their questions, and the office completely shut down any queries afterward, including those by Hatewatch. The investigation was initiated in part because of Palmer’s behavior during the Malheur standoff. Due to his long history of involvement with the antigovernment “constitutional sheriff” movement -- Palmer was “lawman of the year” in 2012 for Richard Mack’s Constitutional Sheriffs and Peace Officers Association, and made numerous speeches and appearances on CSPOA’s behalf in ensuing years – he was approached by leaders of the Malheur takeover about becoming involved, but he initially declined. However, Palmer praised the occupiers as “patriots” in the local press, and met with with some of them in a local café. He agreed to help organize a gathering of the Malheur militants, including leaders Ammon and Ryan Bundy and others, in the town of John Day (the county seat) on the evening of Jan. 26. It was as those people were en route to that gathering that afternoon that they were arrested by an FBI-led law-enforcement operation, and militant LaVoy Finicum was shot to death while resisting arrest. "I felt uncomfortable knowing that I had to relay vital and confidential information to someone who may not be trustworthy," the dispatch manager, Valerie Luttrell, later explained to her supervisor. In fact, it shortly emerged that Oregon State Police had originally planned to make the arrest in Grant County, but moved the location of the planned traffic stop to Harney County to avoid dealing with Palmer. 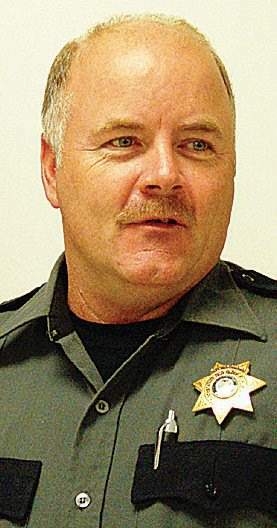 The sheriff faced a flood of criticism from around the state, including several editorials that condemned his behavior. However, Richard Mack defended Palmer, saying he was being singled out for his “constitutionalist” beliefs. The John Day police chief, Richard Gray, subsequently filed a complaint with the state’s Department of Public Safety Standards and Training, which oversees law-enforcement officers’ adherence to standards. Gray detailed the extensive associations Palmer had with the Malheur militants. "I have a great public safety concern when the Grant County sheriff is allowed to openly meet with and be part of this group of lawbreakers," he wrote. Luttrell, too, filed a complaint with DPSST, but in addition to the concerns about Palmer’s handling of the Malheur militants, she pointed out that Palmer was hiring a lot of “special deputies” who were not officially cleared to receive secure law-enforcement information from the dispatch system. Hart reported that public records showed Palmer had deputized seven people as deputies, seven as reserve, five as search and rescue, six as corrections, one as chaplain, nine as special deputies, three as land use deputies, 11 as public lands patrol, nine as public lands deputies, one as limited to concealed handgun license and 11 as a natural resource committee. Palmer has so far refused to explain exactly what kind of arrest and other police powers all these deputies will possess, not to mention where the money to pay for all these positions will be coming from. An incident involving a U.S. Forest Service ranger on Oct. 15 of last year sparked the initial concern. A fire in the Canyon Meadows area had led USFS officials to shut down the area, and the ranger encountered two men in a vehicle in the critical area, so he pulled them over and prepared to write them tickets for trespassing. At first he was concerned because the men were armed and he radioed in for help from Sheriff Palmer. A Forest Service official confirmed that the trespassing tickets were not rescinded and the fines were eventually paid. Linsay Hale, spokesperson for the Oregon DPSST, told Hatewatch that the complaints forwarded by Gray and Luttrell were essentially confirmed in substance, and then forwarded to the Oregon Department of Justice for potential criminal investigation. Her department, she explained, could not determine whether or not any standards had been violated by Palmer’s mass deputization efforts on its own, but would wait until the DOJ had completed its investigation to make any determination.